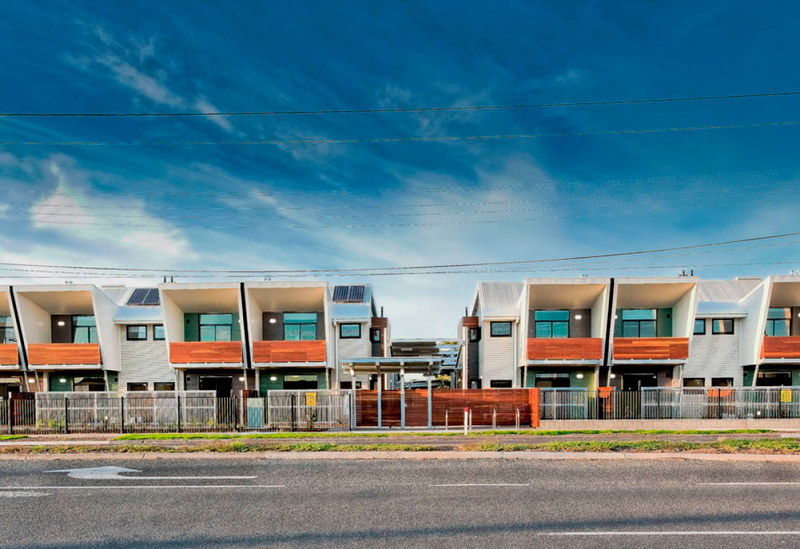 Construction of twenty, one-bedroom apartments delivered through the Commonwealth Government’s Nation Building Social Housing initiative and managed by the not-for-profit housing agency Yarra Community Housing. The building contains seven apartment types and seven apartments which can be adapted for disabled occupants. The two storey building is constructed using precast concrete panels with an integral decorative texture and pigment, concrete structure with cantilevered balconies and steel framed windows. Sustainability initiatives include recycled spotted gum external timbers, solar panels and rainwater harvesting used for toilets and irrigation for garden areas. Quality external claddings and internal finishes in keeping with design intent and client’s budget. Working with consultant team in the re-design of the butterfly roof to improve build-ability whilst maintaining design intent. Project complements the State Government’s vision for renew-able/revitalisation in the suburbs paving the way for a further $80M investment in social housing.